If it had been recorded properly, this could be one of the greatest recordings in Coltrane’s discography, which is to say one the greatest recordings in Jazz. 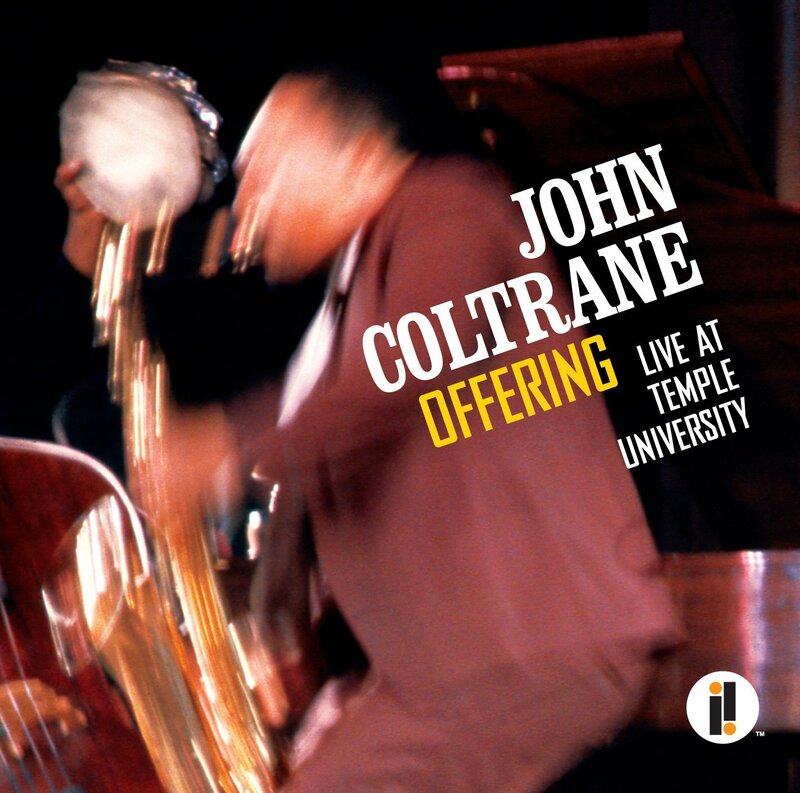 Taken as it is, Offering: Live at Temple University is a crucial document, imperfect and fragmentary, but complete enough, of a concert in which Coltrane was able to markedly expand his conception and presentation of music performance. He had recently played twenty concerts in Japan, all in concert halls. Back home he was mostly still in nightclubs, which his music had long outgrew. Here, at an educational institution in his hometown, he could present the music without liquor, cash registers, cramped stages, low ceilings, without the people who come to nightclubs to play the mating game, and without having to take breaks every 50 minutes. At Temple he had onstage with him black and white musicians, men and women (err, woman), professionals and amateurs. The music embraced diversity. The instrumental configurations changed with each piece: solo bass, delicate tenor and piano duo, roaring drum ensemble, the quartet without Pharoah, the quintet with the added percussion. This was matched by the contrast of Pharoah’s extreme noise-tenor, with the lyrical consonance of Coltrane brought to his pieces Offering and Naima. Coltrane let two young people sit in, one a white student, the other a black saxophonist friend of Rashied Ali’s. Sitting in was common enough when Coltrane played the Vanguard or the Village Gate in New York, but these were people he had never met, never heard. No problem, say your piece. The nine member group and its guests played, most likely continuously, for an hour and a half. The audio recording, from a college radio broadcast, was most likely captured by a single mike at the front of the stage. That’s great for the saxophones, and not bad for the drums, but when those two are playing that’s pretty much all you can hear. The piano becomes audible when the horns drop out, and the bass becomes audible when everyone drops out. There are plenty of weird volume dips, off-mike moments, and beginnings and endings of songs cut-off. But when Trane plays, his sax is clear, vivid, and achingly, heart-breakingly beautiful. For me, this may be Coltrane’s most radical move yet. He is, obviously, not a practiced vocalist, and equally obvious, he doesn’t care. We’re no longer “just” in the world of “music” here, if we ever were. We’ve crossed over to community, to ritual, to happening, to an all-embracing vision in which raw, unmediated expression is more important that any commercial, professional standard. Coltrane sings, students sit in, the local drum circle does its thing. Even if this had been a great audio recording, it could only be a one-dimensional rendering of a multidimensional event. Our hearts and imaginations must fill in the rest. This entry was posted in Recordings, new and used and tagged Coltrane, Offering, Temple University. Bookmark the permalink.